It&apos;s Beginning to Look a Lot Like Christmas! For the past week, I&apos;ve been resisting the urge to put up my holiday decorations. One of the most exciting things about moving into my own house three years ago was buying my first wreath, Christmas lights, and even a little tree. I&apos;ve been trying to hold out until after Thanksgiving, but now that downtown Athens has set up their annual decorations, it&apos;s all over. I don&apos;t know about everyone else, but I can&apos;t help but get excited as I drive through downtown and notice the familiar bows and garlands on the street lights. If you&apos;ve never been to Athens, now is definitely a good time to come visit. The craziness of football season is winding down, it hasn&apos;t gotten too cold, and everyone is getting in the holiday spirit. 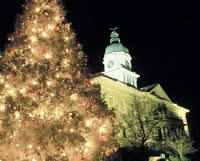 Click here for more information on the holidays in Athens from the Convention &amp; Visitors Bureau.